Bed Rug, Does Any One? Discussion in '2nd Gen. Tacomas (2005-2015)' started by mvega1969, Nov 29, 2007. Does any one has a bed rug for a Double Cab - Long Bed Tacoma? I'm wondering how much customized is at the installation time. Most of the Tacomas has storage spaces and a some of them the 110V converter connector. Are these features are available once the installation has finished? I think if you own a bed rug, you bought the wrong vehicle.....get a 4Runner...With a bed rug, when is the bed ever going to see the light of day,let alone any rain?....Just my 2 cents! At work I had the same suggestion and with a live example I reply to them (a partner has one and she parked that day at my side) and I will answer you back, Do you know how much covered, closed space is in a 4 Runner beyond its two rows of seats?, compare that to a Tacoma's long bed, that BIG is my clean, dry and safe space inside the camper. I just put mine in today. Took about an hour and everything fits great. No work arounds and you can get to everything. I had a Bed Rug in my Ram. It was not covered or anything, and was made of material that would stand up to the elements. 1. Really, REALLY hard to clean grass, small sticks, dog hair or anything of that nature out. It all git stuck in it. 2. I couldn't slide anything in the bed anymore. One purpose if having the rug is to keep everything from sliding, I know this but I had to load up some heavy furniture and when you would normaly put one side in the truck and slide it in, you weren't able to do anymore because the rug would not allow you too. 3. Unless you screw it down, the rug is only held in with velcro. So I was always worried thaet some one would take it out of the truck! sschulz, congratulations on yours, I know it will be used in a long term. I'm on the list to get one. I like the fact that stuff stays put. I don't want it sliding around. Also like the fact that it's more cushiony than a spray on and resistant to a lot of chemicals. I heard you can pressue wash it too. Looking forward to getting one. i had one under my tonneau on my s-10 and i loved it. 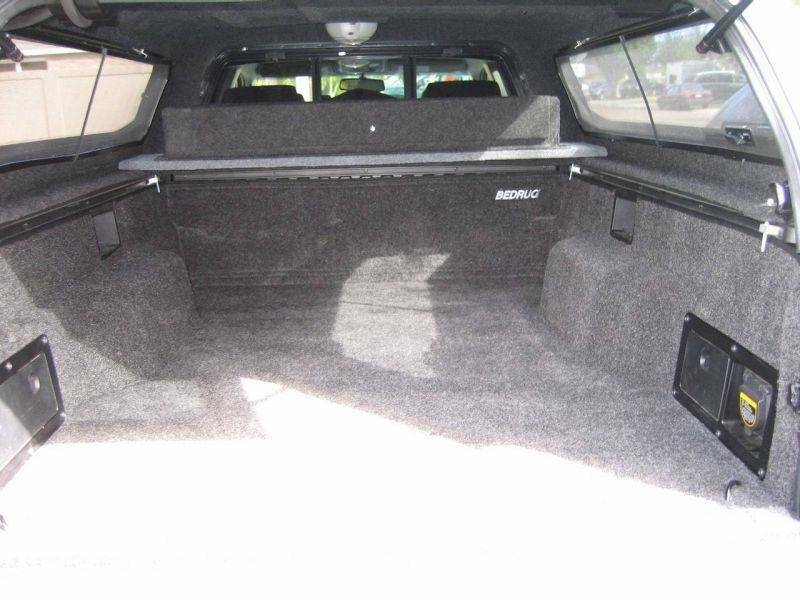 i carpeted the underside of the tonneau as well, so w/ it propped up all u saw was carpet. check the gallery here and one guy has a browning leer shell w/ a bedrug in it w/ good pics. It is my outdoor hotel, enough for up to three average people. Do not worry, I started this thread before I got it installed... a lot of question prior to the final decision.